The GBSSRL has no comprehensive list or map of landslides or areas of potential landslides. Some, but not all, geologic maps do show landslides. The NBMG Publication Sales Office also sells NBMG Urban Area Maps for flood and debris-flow hazards and slope, which use 7.5' topographic maps for a base. 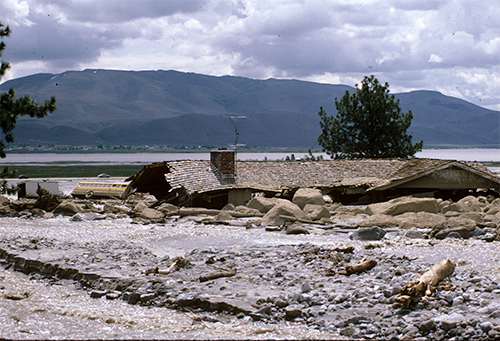 Flood and debris-flow hazards are available for Carson City 1Al, Genoa 1Cl, Las Vegas SE 3Al, Las Vegas SW 3Bl, South Lake Tahoe 2Al, and Washoe City 5Al. Slope maps, which color code percent slope, are available for Boulder City 3Eb, Boulder City NW 3Fb, Carson City 1Ab, Elko East 6Bb, Elko West 6Ab, Ely 7Ab, Griffith Canyon (see Spanish Springs Valley NW), Henderson, 3Gb, Las Vegas NE 3Cb, Las Vegas SE 3Ab, Las Vegas SW 3Bb, Mt. Rose NE 4Bb, New Empire 1Bb, Reno 4Ab, Reno NE 4Cb, Reno NW 4Db, South Lake Tahoe 2Ab, Spanish Springs Valley NW 4Eb, Steamboat 4Fb, Verdi 4Gb, Vista 4Hb, and Washoe City 5Ab. Of course, the percent slope can also be calculated from a topographic map for a given area. Aerial photographs can be useful in determining areas of past and potential future landslides, and some of the Earthquake Hazards maps in the NBMG Urban Area Maps imply some areas of potential landslides. The USGS has some landslide information, and our website has several generalized publications on landslides. For information on a particular site, one may also check with the local county engineer's office or hire a consulting geologist or engineering firm to do a site study.